Last year, we were promised dual boot mini PC based on Intel that would run Windows 8.1 or Android 4.4, but finally companies decided against shipping a dual boot firmware, and simply loaded Windows 8.1 on their machines. Kingnovel sent me their K8 mini PC, better known as Wintel W8, based on Intel Atom Z3735F, and that can dual boot Windows 8.1 with Bing or Android 4.4. Today, I’ll go through the specs first, take some pictures of the device, and tear it down to have a closer look at the hardware, and in a separate post I’ll quickly check out Windows 8.1, before spending a bit more time on Android 4.4 to see how well or bad Android runs on Intel platforms. One noticeable difference is the presence of an IR receiver which can be used in Android, but not in Windows… The Android firmware includes the Google Play Store and Kodi 15 alpha. 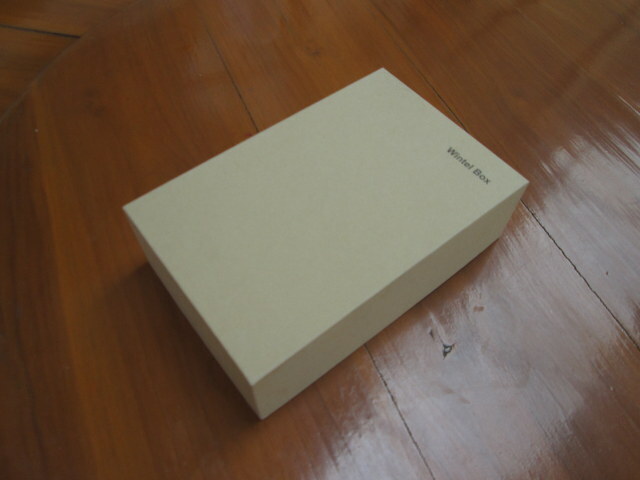 Kingnovel sent me the parcel with DHL, and I received in a simple cardbox marked with “Wintel Box”. Most of the times Intel mini PC only come with the power supply, but the package also included an HDMI cable. The power supply included takes 100 ~ 240V 50/60 Hz input, and outputs up to 5V/3A. The power button and IR receiver are on the front panel, two USB ports and a micro SD slot can be found on the side, with the rear panel featuring an headphone jack, the Ethernet port, HDMI output, a micro USB port, and the power jack. 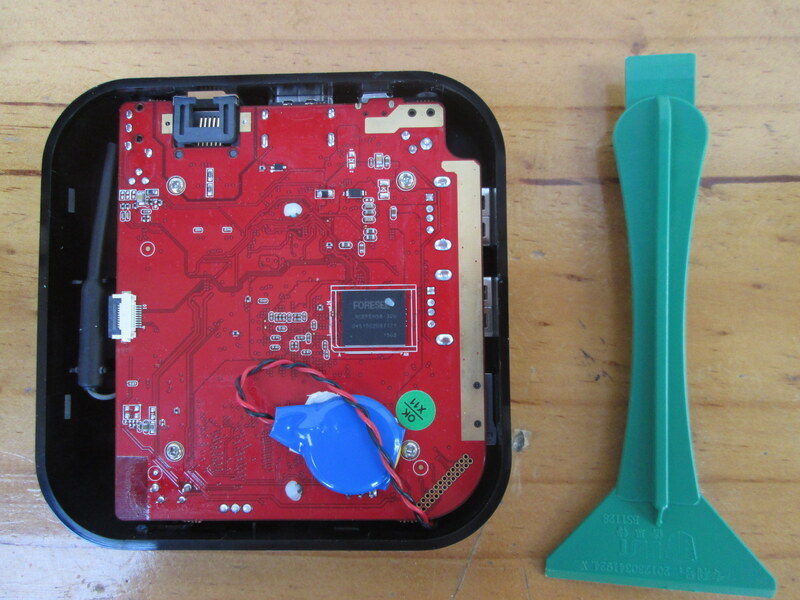 You’ll need a small plastic tool to unclip the bottom of the case, which comes out rather easily. 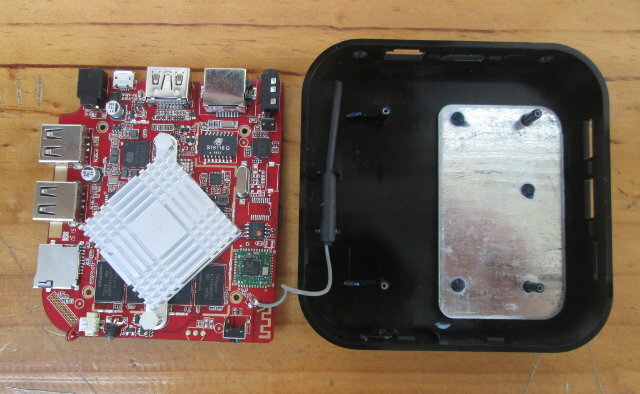 We’ll find a battery for RTC as well as the 32GB FORESEE NCEFEH58-32G eMMC flash on the bottom of the board. There are also a few through holes on the bottom right, and an unused 10-pin connector on the left of the board, but I can’t really guess what these are for. The Wi-Fi antenna can be seen on the left of the enclosure. You’ll need to remove four small screws to completely take out the board from the case. There’s a heatisnk on the Intel processor, as well as another metallic plate for cooling fastened to the top of the plastic enclosure. 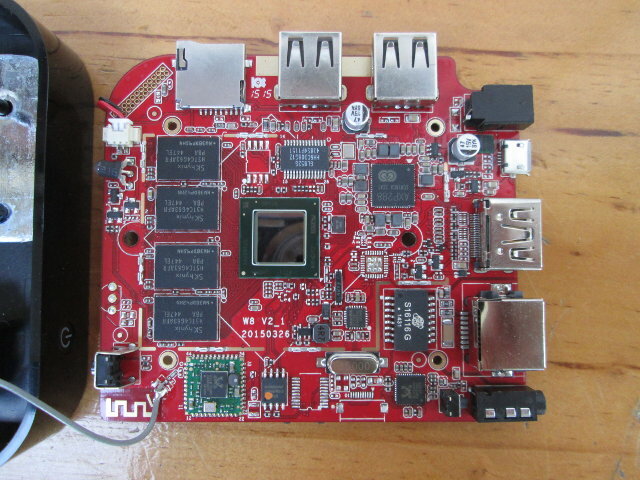 Four SK Hynix H5TC4G63AFR DDR3L chips are used to get 2GB RAM, Genesis Logic GL852G USB hub is for the USB ports, and the Wi-Fi module used in this board is Realtek RTL8723BS. The IR receiver / LED is located on the top left of the picture, and we can find the recovery switch right behind the headphone jack. Kingnovel can provide their K8 box to resellers and wholesalers, and if you’d like to purchase in quantities you could contact them via their Kingnovel K8 product page. Individuals can pre-order Wintel W8, which should feature the same dual boot firmware, on Geekbuying for $126. A model called Wintel CX-W8 is also available on Aliexpress for just under $100, but with Windows 8.1 only, and most probably without a proper Windows license. is there enough space for an 2,5 or 1,8 HDD? My 2.5″ SSD is a little longer than the width/length of the box, so definitely no for 2.5″. Looks like the PCB is different so I wonder if something else has changed? There’s Beelink mini PC -> http://www.cnx-software.com/2015/02/04/beelink-introduces-tv-sticks-and-mini-pcs-powered-by-intel-atom-z3735f-processor/ , but it’s not for sale yet. That’s the Pocket version, no SATA here. I don’t think the power consumption is 10W while idle. 10W is the maximum power dissipation of the processor. If I remember correctly the device will boot automatically as I plug the power supply, so I assume the answer is yes. dose any one know how to root this box in android model ? I managed to cut myself out of my wintel w8 by accidentally disabling the USB controller from the UEFI, do you know any way to reset it to the defaults without a keyboard? I feel such an idiot right now. You should be able to remove the battery on the main board for 10 seconds to an hour. Plug it back in and plug in the power adapter and start it up. It should reset the bios settings. I am new to the Win8. Unless I learn something differently, the only thing I can suggest is to try and contact whomever you purchased your unit from and see if they will step-up and help you with this! If they do, would you please post back so rest of us will know. Thanks. I did, they said the only thing is to send the unit back to them so they can reflash the bios directly to the chip. I’m guessing I could do the same if I had the programmer, but I can’t justify buying it. I have ordered my W8 exactly same to this one and wondering if BIOS can be updated to 64bit from 32bit or vice verse. Also, do you have basic driver for W8 motherboard. Can we install the following pieces of software. One week ago, i was installing office in my unit and when the process was running, it stops and the image was freezes. After a moment, I disconnected it and it never turned on again. There’s anyone that knows something about this problem? Or that have an idea of what could be happening? It looks like a “not-enough-power” issue. Are you using the included power source or a different one. To others: were you able to connect the device to a PC using the mini-USB port? My PC can’t see it. My device also came with un-activated Windows; I guess this is why it was sold at 90$ w.r.t. original 250$ price…. Maybe the Volume Licence expired. I think the author mis-identified the upper-left LED: it’s not an IR receiver… it’s just the status LED! Is there a Way (in Android or Bios) to disable the intern Monitor an set the HDMI out as primary Monitor ? For Windows is not Problem but Android is not rootable and many Aps dont playing. The Hardware is from a Pipo with Display and this is not disabled. I have a WINTEL W8 box. I need to be able to set it to power back up on power loss on the windows side….I cant find it in the Bios…Please advise how I can achieve this. Anyone?? Hi. I’d like to know whether it is possible to upgrade the ram to 4GB or not? If your answer is positive, what kind of ram model should I search for to substitute it? Win os then i’m set new resolution window no signal i can reset?? can someone know hot to change resolution for android, from automatic to manual ??? i need 1600×1200 permanently … ??? how to go to bios on Wintel w8 and how to reset everything to default. I format all of my Wintel W8 dual OS and now I’m not able re-install Android. I’m trying with Android Remix but can’t install because it have Efi 32bit, I’m trying with Android x86 and I can install it but the audio not working. There is a image I can download? You can’t simply download random images on the internet, and expect it to work. I have wintel dual boot. In that system android is working fine but not windows. When i try to start windows, the system gets restarting. Can you tell me the solution to get out from this problem. ho un problema…non riesco ad entrare in android..come faccio? because doesn’t accept the password, what I need to do ?